Petition for Charter: 1805 "Note that no student at the University would be admitted without permission of the Grand Master." A HISTORY OF ONE HUNDRED YEARS, BY DR. SKINNER. With snowy beard and silver hair. The mellow light of fulfilled dreams. Of this our loved Fraternity. Behold how swift the sands do run. Of friendship formed and kindly deed. Our dreams of human brotherhood. The new cent'ry excelled the old. Now if I can succeed in dismounting without being ignomini-onsly thrown from this hobbling Pegasus, I will endeavor to walk among prosaic facts and figures. Surely no child ever had a more queenly or royal mother than Amicable, for she was no other than Aurora, "Goddess of the Dawn," "Bride of the Morning." Ancient mythology has a wonderful story to tell about Inland Amicable's brother, the brave, heroic Trojan boy, Memnon, who lost his life in battle. On the banks of the Nile, in Egypt, a statue was erected to his memory, which remains to this day. And the record tells us that "when the first rays of the rising sun fall upon this statue, it gives forth musical sounds like the twanging of harp strings." Aurora, the mother, is greatly grieved for the loss of her boy. Her tears still flow and may be seen at early morning in the form of dewdrops on the grass. And yet she has great comfort and takes a motherly pride in the fact that she has a daughter, vivacious, comely, beautiful, bearing a name that invites confidence and good will; indeed more than this, for, while she is no flirt, she has had hundreds of suitors who have fallen in love with her and sought her hand. And to show how Amicable and impartial she is to all those who seek her favor, she says to each one, "I extend to you my right hand in token of my good will and love for you, and so you take me as I do you, as the expression of our engagement, and I will whisper in your ear a secret, as between lovers, but do not tell it to anybody outside." And each one is so elated with this supposed special confidence that he is the favored suitor that invariably he is carried off his feet. What a charm dear Amicable must have. "Age cannot wither her, nor custom stale her infinite variety." We have almost forgotten the queenly mother in our admiration for the daughter. And so we will turn and take a look at her. "The system on which the Aurora Society was founded is as follows, viz. : We, the subscribers, desirous of promoting the good of Masonry, and wishing to form a society for the purpose thereof, do, as members of the institution, agree to assemble ourselves together at an appropriate place that shall hereafter be appointed by the subscribers, and that we will meet at Mr. Hovey's house, on Saturday evening next, to constitute rules and make arrangements for that purpose." This agreement was signed by Daniel Warren, Asa Ellis, Benjamin Bigelow, Charles Parks, Nathaniel Livermore, Isaac Barnard, Nathaniel H. Whitney, Jr., Nathan Greene, Samuel Albree, John Wheeler, Andrew Adams, Luke Hemenway, Elijah Learned, Nathan Fisk, Salmon Morton, Ebenezer Watson, Daniel Smith, William Warren. Art. 1st. That we have a meeting at Mr. Hovey's house, in his southeast chamber, every Wednesday evening in each week, for the promotion of Masonry, and on the first evening convened we will elect a Master to preside over the society, a Secretary to keep a just record of all proceedings, and all other officers as in regular Lodges aud to be chosen by written votes. Art. 2d. That we elect our officers every eight weeks. Art. 3d. That the society shall not consist of more than twenty-five members, and any Brother wishing to become a member shall make application to one who is such, who shall propose him, and he stand proposed at least one week, and then balloted for and if unanimously accepted will be admitted. Art. 4th. That, when a Brother offers anything for the good of Masonry, he shall address himself to the Master, and no Brother shall have the liberty to speak till he has so clone, that there be no confusion, and no Brother is to speak more than twice on one subject. Art. 5th. That any Brother or Brothers refusing to conform with respect to the order of regulations of the society, he or they may be liable to be exiled therefrom, by a majority of two-thirds the members. Art. 6th. That all transactions of the society shall be kept secret from the world. Art. 7th. That each member shall pay two dollars at his admission, and subscribe to the articles of the society, and that we request of visiting Brethren twenty-five cents for each and all evening's they may honor us with their visits. Art. 8th. That every member shall punctually pay one dollar quarterly (of a year) and, refusing to comply therewith, acts reverse to the order. Art. 9th. That all moneys shall be collected by the Secretary, and deposited in the hands of the Treasurer, taking his receipt therefor. Art. 10th. That the expenses shall be defrayed out of the treasury and that do expenses may arise unless conformable to the Masters direction. Art. 11th. That the arising fund shall be put to use on interest and a Brother shall have the preference of it by giving an approved endorsed note, but for no more than sixty days without renewal, and, refusing to pay or renew the note, the Treasurer shall have power to collect the same. No Brother shall have the loan of it more than four months if requested by any other Brother. Art. 12th. That the hour of meeting shall be affixed by the Master and Wardens and shall close precisely at half-past nine. Art. 13th. That the Brother who accepts the office of Tyler shall be exempted from all expenses arising from the society, and that he receive his part of the benefit of the fund and such further compensation as the society may hereafter grant. Art. 14th. That if two-thirds of the members of the society appear dissatisfied with the by-laws, there shall be a committee chosen every eight weeks for a revision. These by-laws were signed by all the original associates (except Ebenezer Watson) and also by James Fillebrown, Richard Bordman, Samuel Cutter, Joseph Ayres, Benjamin Glover and Benjamin Bowers, who were admitted members before a charter was obtained. At the same meeting officers were elected, to wit: Andrew Adams, Master; Nathan Crane, Senior Warden; Elijah Learned, Junior Warden; Asa Ellis, Treasurer; Nathaniel R. Whitney, Secretary ; Samuel Albree, Senior Deacon; Nathaniel Livermore, Junior Deacon; Nathan Fisk, Senior Steward; Isaac Barnard, Junior Steward; Charles Parks, Tyler. The society continued its weekly meetings at Mr. Hovey's house, which were chiefly devoted to the lectures on the three degrees, and on the tenth of April re-elected their officers. Preparations were soon made for obtaining a charter. Less than two months after the organization of the society, on the third of April, 1805, a committee was appointed to "regulate a system and procure a charter," so the record reads. "To the Most Worshipful Grand Master, officers and members of the Most Worshipful Grand Lodge of Massachusetts, holden at Boston. "Brothers: The undersigned, having been regularly initiated into the three first degrees of Masonry, have associated for the purpose of perfecting themselves in the sublime art, and, having the prosperity at heart, they are desirous to exert their endeavors to promote and diffuse the genuine principles of Masonry. Considering the growing population of the place, and the situation of their respective dwellings are such, however, that they cannot attend any of the Lodges in the vicinity without subjecting themselves to considerable inconvenience — for these and other good reasons they are desirous of forming a new Lodge in the town of Cambridge near West Boston bridge, to be named Oriental Lodge. (There being a Lodge of this title under the jurisdiction of the Grand Lodge, they saw fit to name it Amicable Lodge.) In consequence of this desire, they pray for a charter of constitution to empower them to assemble as a legal Lodge to discharge the duties of Masonry in a regular and constitutional manner, and they have taken liberty to nominate and recommend Andrew Adams to be their first Master, and Nathan Crane to be their first Senior Warden, and Elijah Learned to be their first Junior Warden, and, if the prayer of this petition be granted, they promise a strict conformity to all the constitutional laws and regulations of the Most Worshipful Grand Lodge. "They have the honor to be, Brethren, your fraternal, humble servants." This petition was presented to the Grand Lodge, June 10, 1805, was granted and the charter duly issued under the same date. It was the desire of the Brethren that the Lodge should be consecrated and the officers installed on the first Wednesday of October, 1805; but the ceremony was delayed until St. John's Day, June 24, 1806, when the Grand Lodge attended, a sermon was delivered, a public dinner was provided, and all the ceremonies were conducted in Ample Form. It appears that Rev. Brother Thatcher was chosen to deliver the sermon. It is said that a doctor never takes his own medicine. At the next meeting of the Lodge, after the consecrating ceremonies, it was "voted that Brother Bartlett present Rev. Brother Thatcher with thirty-five copies of his discourse. Also voted that each member shall be obligated to receive and pay for six copies of Brother Thatcher's sermon." We come now to a season of shadow in the affairs of the Lodge, which darkened down into almost a total eclipse, and the Lodge was nearly strangled in its infancy. It was brought about either by some miscalculation or disappointment, or over-credulity, not to use the word extravagance. The public demonstration on the occasion of the consecration of.the Lodge, and the installation of its officers, was no doubt very gratifying to all parties concerned, and a proud day for the Brethren. But the receipts fell far short of the expenditures, and the Lodge found itself embarrassed by a heavy debt. Worshipful and Rev. Lucius R. Paige, of blessed memory, who was the historian of the Lodge fifty years ago, speaks of its affairs at that time with some detail. I quote some things: "It must not be forgotten," he says, " that it was in the period of the embargo, and the almost total prostration of business which preceded the War of 1812, so that what might seem to us, at this day, a small debt, was then truly a very serious matter. On February 7 (1807), the standing committee reported that the Lodge was indebted, beyond its present means of payment, in the sum of $240.73." Subsequently nineteen Brethren advanced $5.00 each, to meet the most pressing demands, which, as this memorandum expresses it, was to be refunded as soon as the. Lodge can make it convenient, with interest." So severe became the pressure of this debt that a proposition to surrender the charter was made and discussed. In the meantime, the Lodge had removed to Old Cambridge, first to Bordman's Hall, on the westerly corner of Dunster Street and Harvard Square, where it met Jan. 13, 1808; thence to Porter's Hall on Brighton Street, March 9, 1808; and thence back to Bordman's Hall, Nov. 21, 1808, at which last date it was determined that "the consideration of the question for resigning the charter be postponed to the next regular meeting." At the next meeting, Dec. 14, 1808, it was voted "that the further consideration of the question concerning resigning the charter shall subside for the present." At this meeting, which may be regarded as the crisis of the most severe trial which the Lodge ever endured without breaking down, the plan was discussed for the payment of the debt. I need not enter into a detail of the plan; briefly, it consisted in taxing the members for a certain time until the debt should be paid. The effort was successful. The burden was thrown off, and from that day forward the Lodge has never been crippled by a debt. There is one significant fact connected with this year of trial and discouragement, and more than probable it is owing to this fact that the charter was not surrendered, says Brother Paige. The three principal chairs were never more worthily filled than during that year. The Master was Samuel P. P. Fay, afterwards Grand Master of the Grand Lodge; the Senior Warden was Augustus Peabody, also afterwards Grand Master; and the Junior Warden was Rev. John Bartlett, afterwards Deputy Grand Master. I doubt whether another case like this can be found in the Commonwealth, where the Master and Wardens, serving together in a subordinate Lodge, have all been thus promoted." We may understand, notwithstanding such men were at the head, that so discouraging was the outlook, "that only two candidates were initiated during the year. Neither, however, became a member." "The attention of the Masonic Fraternity has seldom been called to a more interesting subject than that submitted to our consideration. Indeed, our charities are never more characteristically and appropriately applied than in mitigating the horrors of war, visiting the sick and the wounded, assuaging the agonies of bodily and mental distress, and supplying the hungry and naked. And these offices of humanity we may discharge to the stranger and sojourner, and even 'see through pity's melting eye a Brother in a foe,' without incurring the guilt or penalty of treason against the laws of God or man. "The groaning of the prisoners has now reached our ears, and has not been disregarded by the Grand Lodge, whose readiness to provide for those who are the immediate claimants of its sympathy will, it is hoped, meet the approbation and receive the support of our whole Masonic family. "The present object of our charities is to relieve the distress of Masons whom the fortune of war throws within the sphere of our attention, and, although their duties as citizens of a country with whom we are at war may have compelled them to combat with Brethren, they have a powerful claim to our compassion. "The moment the sword of the warrior is sheathed, the feelings of the Mason return with redoubled force and charity, displaying her banner of love, he conducts the captive Brother to the Lodge, the only 'city of refuge.' The appropriation granted, at the benevolent instance of Essex Lodge, has been made in the fullest confidence that the Lodges under our jurisdiction, aided by those Brethren who are blessed with affluence, will cheerfully engage in the charitable work of affording the means, compatible with their ability, of replacing the grant in the funds of the Grand Lodge, and enabling it to dispense still greater charity should the continuance of the war render it necessary. "For this purpose _____ Lodge is called upon to comply with the wishes of the Grand Lodge. "The repeated instances of brotherly love which have been, and still continue to be exercised towards our Brethren, carried prisoners of war to Great Britain and her dependencies, are gratefully acknowledged. Tt is our pride and consolation that the fires of Masonic charity burn with fervor on transatlantic altars. We most devoutly offer our prayers to the Supreme Architect of the universe for the return of peace, and that the only point at issue among contending nations may be a charitable emulation in the promotion and practice of those virtues which exalt and adorn our nature. But, whatever may be the result of public measures, the Masonic Institution will ever yield a respectful and loyal submission to their civil fathers. "And the Grand Lodge takes this opportunity of expressing a wish that the Fraternity may eminently display to an admiring world the genuine and exalted principles of our Royal Craft, and exhibit the glorious specimens of pure and disinterested love which Masons bear each other." It is pleasant to record the fact that, although Amicable Lodge was poor, it made its contribution. And it may as well be stated here that, besides the very large amount expended in charity where the left hand knew not what the right hand did, it has taken an interest in many public matters. For instance, it is a part owner of Bunker Hill Monument, having contributed $100 towards its completion. A liberal sum was also donated in aid of a monument to George Washington, at Fredericksburg, Va.; also to the Mount Vernon fund; also $200 towards the relief of those who suffered by the great fire in Chicago, adding also a contribution towards the completion of the Washington Monument. Some people have a passion for moving because of the novelty of the thing, and some from necessity. Amicable Lodge may be classed under the head of necessity. It continued to occupy Bordman Hall until Oct. 10, 1810, when it removed back to Cambridgeport, to the hall of Brother Samuel Cutler. Here it continued until Sept. 20, 1815. Three days afterwards, September 23, occurred the memorable gale which destroyed much property throughout New England, and, among the rest, "demolished " as the record says, "the building" in which the Lodge had met. The next meeting was in the schoolhouse on Franklin Street, October 16. Soon arrangements were made with Mr. Fogg, who had become the occupant of the Hovey Tavern, at the corner of Main and Douglass Streets, and the Lodge returned to its original location. There it remained until Sept. 21, 1818, when it removed into a very convenient room fitted up at the expense of the Lodge, in the second story of the Franklin street schoolhouse, and named "Freemasons Hall," where it remained for the next twenty years, until the second day of July, 1838. The first ten of these years was a season of the greatest prosperity under the original organization of the Lodge. It attracted the attention of the community, many sought its fellowship, and among its members were reckoned some of the most respected and influential citizens of the town. In 1820 a charity fund was established which now amounts to $5,825. It was during this period of twenty years the anti-Masonic war broke out. It was one of those crazes which take possession of a people sometimes and can hardly be accounted for on philosophical or psychological grounds, like the Salem witchcraft. Here was a delusion that strangely got hold, not of the ignorant, but men of culture and education. Rev. Cotton Mather, Judge Stoughton, Rev. Mr. Noyes, Increase Mather, the president of Harvard College, came into the full belief that there were witches and bewitched people. Oftentimes these witches would be some poor half-witted person — an Indian squaw. Sometimes the witch would come in the form of a cat, sometimes an old woman would be seen riding through the air on a broom-stick. This delusion was a very serious and tragical business, and these poor, crazy, sick and suffering creatures would be arrested and tried and found guilty of being in league with the devil. In one year, twenty were executed, nineteen by hanging and one by being pressed to death, and among these a clergyman and several of the most reputable citizens of Massachusetts. They thoroughly believed that these witches had formed a compact with the devil, and were his agents to torment and torture people. And these judges and ministers and president expressed no regret for the innocent blood that had been shed. We wonder to-day that such things could be. We wonder to-day that Quakers should have been so persecuted, and, in this land of the Puritans, that Massachusetts should have hung Mary Dyer on Boston Common; that Massachusetts should have driven Roger Williams beyond the borders of the colony, not because he was a bad man, but because he was a generous, broad-minded man. It was something after this sort of spirit or craze that broke out in the anti-Masonic war. In September, 1826, commenced the tornado in the State of New York, and the storm swept through the whole United States. Masonry was declared to be the sum of all villainies. Political demagogues took advantage of the excitement to work their schemes. The storm swept into the churches, and they were torn by its fury. It invaded the family circle, brother was arrayed against brother, father and mother against son, wife against husband, and "a man's foes were they of his own household." Anti-Masonic conventions were, held, anti-Masonic newspapers were published which did not scruple to declare absolute falsehoods, anything to kill out Masonry, and it was confidently announced that the day of judgment to the Institution had come — that it was about to be wiped off the face of the earth. On May 19, 1780, a most unaccountable darkening of the whole visible, heavens occurred in.New England, known in the records as the "dark day." It was the occasion of intense alarm and distress to multitudes of people, as well as to the brute creation, the fowls fleeing, bewildered, to their roosts, and the cattle returning to their stalls. Thousands of good people became fully convinced that the end of all terrestrial things had come, and many gave up for a time their secular pursuits, and betook themselves to religious devotions. Many regarded the darkness as a token of God's indignation against the various iniquities and abominations of the age. It is related that the Connecticut Legislature was in session at the time, and so great was the darkness that the members became terrified and thought that the day of judgment had come. A motion was consequently made.to adjourn. At this a Mr. Davenport arose and said: "Mr. Speaker: It is either the day of judgment or it is not;' If it is not, there is ho need of adjourning. If it is, I desire to be found doing my duty. I move that candles be brought, and that we proceed to business." Well, the day of judgment had not come and the Legislature did not adjourn. If it was a day of darkness for the Masonic Fraternity, it was not the day of judgment, as many a fanatic prophesied, and some of its friends feared, but there were found any number of Davenports who said, "We desire to be found doing our duty; let the candles be brought, and let us proceed to-business," and many a light was kept burning on the Masonic altar, and the mists rolled away. Amicable Lodge felt the fury of the storm, but for ten years, it kept up its organization and the light burning on its altar; until the second day of July, 1838, when it was thought best to suspend, at least for a time, and surrender the charter. But to the credit of the Brethren, with ,a few unhappy exceptions, although they returned the charter to the Grand Lodge, they held fast to their individual integrity and their Masonic vows. But. the anti-Masonic bitterness had not subsided in Cambridge, and it was manifested in the action of the people. At the last meeting of the Lodge, a committee, previously appointed, submitted a report which was adopted. The proposition was made "that all the funds of the Lodge, after its veal estate, furniture, etc., are disposed of, and its debts paid, be conveyed to the town of Cambridge, in trust, for the purpose of forming a fund. . . That the interest shall be paid, on application, to such members, past or present, of Amicable Lodge, or their families, as the selectmen for the time being shall consider objects of charity; that interest unappropriated shall be added to and form part of a permanent fund, and, when that fund shall amount to the sum of $5,000, the interest shall annually be distributed to any resident of the town of Cambridge, not a public pauper, considered a worthy object of charity." Knock as they pleased, there was nobody at home." "He who laughs last, laughs best." The refusal to accept the proffered gift proved to be a blessing to Amicable Lodge. The money remained in the hands of friends, increasing by the accumulation of interest, until the restoration of the charter, and constitutes to-day a part of our charity fund. For seven and a half years the Lodge was suspended, but many of the Brethren were not without hope, and the subject of reorganization was frequently discussed, "both by former members of the Lodge and by other Masons who had not been members." Finally, eleven Brethren formerly of the Lodge, and others who had perhaps come into the town, united in a petition for the restoration of the charter, and on the twenty-seventh of December, 1845, the charter was restored. No one was more instrumental in the accomplishment of this result than Rev. Brother Lucius R. Paige, who in 1832 had moved into the town, and who, on the reorganization of the Lodge, became its first Master, and during the remainder of his long, life, which reached to more than ninety-four years, none were more interested in or did more for Amicable Lodge than he. On the reorganization of the Lodge, arrangements were made with Friendship Lodge of Odd Fellows, by which it occupied their hall on Main street until Aug. 12, 1854, when the hall was destroyed by fire. Soon afterwards, however, the Odd Fellows fitted up a hall on Pearl Street, to which Amicable Lodge removed. From there, because of the rapid growth of the Lodge and the necessity of increased accommodations, spacious apartments were secured and fitted up by the Lodge on Main street, in the building which has been demolished to make way for the new Cambridgeport Savings Bank building now in the process of construction. These apartments were dedicated on Jan. 4, 1866. We may add here, as an incident of more than common interest and as an illustration of the radical change in public opinion in regard to Masonry, that on the evening of January 30, the Lodge-room was invaded by the wives and sisters and lady friends of the members, not for the purpose of discovering the secrets of Freemasonry, but to add to its efficiency. They brought with them, and by Mrs. C. A. Skinner, wife of the Chaplain, as their representative, presented to the Lodge an elegant Bible and two silver-mounted batons, as the expression of their good-will and confidence in an institution to which " men rush in, where angels fear to tread." For nearly forty years that Bible has graced the altar of Amicable Lodge, and those batons have been used by each succeeding Senior and Junior Warden. There was also presented to the Lodge by Brothers Caleb C. Allen and Henry Endicott a very handsome marble-cased clock, which the Brethren make use of for the "noble and glorious purpose of dividing their time, whereby they find a part for the service of God and a distressed worthy Brother, a part for their usual vocations and a part for refreshment and sleep." Buy with gold the old associations." The last meeting, when we said "good-bye" to the place which had been our Masonic home for so many years, was on Jan. 7, 1904. On Feb. 3, 1904, the Lodge held its first meeting in its present quarters in Odd Fellows Hall, on Massachusetts Avenue, corner of Walden Street. Amicable Lodge does not believe in or practise "race suicide." She has four splendid children that she cherishes and they love her. The first, named Putnam in honor of the hero of Revolutionary days and glory, was born Dec. 13, 1855. The second, named Mount Olivet, of sacred memory and association, the mount which was pressed by the feet of Him who first really taught the world the truth of the human brotherhood — this child was born March 9, 1864. The.third, Mizpah, a name so significant in its meaning, which finds expression in these words : "The Lord watch between me and thee, when we are absent one from another," was born Sept. 9, 1868. The fourth, bearing a name which is said to express the greatest'of all Christian graces, faith, hope, charity, these three, but the greatest of these is Charity, was horn on March 9, 1870. A happy family! "May they live long and prosper!" Notwithstanding the old hive has swarmed so often, we now number three hundred and twenty-five members. I record here what I think we may justly call our roll of honor. Richard Bordman and James Fillebrown, charter members, were Revolutionary soldiers. In the War of 1812 were Captain Samuel Child, Jr., Ensign Eliab W. Metcalf, Corporal Jacob H. Bates, Fifer Nathaniel Munroe and Private Galen Ware. Patriotism has been a marked characteristic of the Brethren of Amicable Lodge. I hold it to be a remarkable example of this fact that one-fifth of the members enlisted in the Civil War: Past Worshipful Master James K. Odell, our present Worshipful Master, Charles P. Keith, and these Brethren: L. P. Estabrook, Nathan G. Gooch, David P. Muzzey, Rudolph Anderson, Walter W. Nourse, Andrew A. Teele, Gustavus A. Smart, William J. Dowd, Dr. A. C. Webber, Robert N. Roaf, J. Warren Cotton, James Chandler, Charles T. Seavey, George W. Smith, Joseph Britton, George T. Richardson, Oliver H. Webber, Dr. A. P. Clarke, Charles H. Titus, Atkins Higgins, John R. Mills, George W. Blish, Henry C. Hobhs, George H. Henry, Thomas G. Newgent, David A. Stevens, Charles W. Adams. In connection with these Brethren, there is one incident of pathetic interest. Walter W. Nourse was the first soldier to give his life for his country from his regiment, the Thirty-eighth Massachusetts. He was brother to the then presiding Master, Gilbert D. Nourse, and a son of R.W. Gilbert Nourse. The sword and scabbard worn by the son and brother were presented to Amicable Lodge by the father, with the request that "they be worn by the Tyler on all proper occasions." It is the sword worn by the Tyler today. In our roll of honor there are reckoned three Grand Masters of the Grand Lodge, Samuel P. P. Fay, Deputy Grand Master in 1819, and Grand Master in 1820; Augustus Peabody, Senior Grand Warden in 1817, and Grand Master in 1843-4-5. Henry Endicott, Senior Grand Warden in 1873 and Grand Master in 1887-8-9. I risk nothing in the fear that I may touch any sensitive spot. or stir any envy or jealousy, among the living Past Masters or the present Master of Amicable Lodge, in the statement that there is one Past Master to whom Amicable Lodge, as well as Masonry, in Cambridge, not to say in the Commonwealth, in the more recent years, owes a debt of gratitude more than to any other. Henry Endicott is a name to conjure by, a name writ large in our history, and a name writ very large in the hearts of the Brethren. That flows whene'er we meet." Lucius R. Paige was Deputy Grand Master in 1852-3-4; Charles Harris, Junior Grand Warden, in 1887. Of District Deputy Grand Masters there have been S. P. P. Fay in 1817, W. J. Whipple in 1823-4, E. W. Metcalf in 1824-5, W. Hilliard in 1829-30, Henry Endicott in 1867-8, L. M. Hannum in 1882, Charles Harris in 1883, and our present Deputy, Henry A. Locke, 1904-5. Our Senior Chaplain has been Grand Chaplain of the Grand Lodge for the term of fourteen years. In this roll of honor, the name of Charles Tufts should not be omitted, who served Amicable Lodge as its Secretary, for more than half of its term of existence, or fifty-seven years. There was one member of Amicable Lodge whose name became world-wide. Brother Anson Burlingame was made a Master Mason Jan. 5, 1854. Beside serving in the Massachusetts Senate, he was a Member of Congress for three terms. It was while serving there an incident occurred which drew the attention of the whole country. Because he was impelled alike by his friendship for Senator Charles Sumner, his strong sense of right and justice, and bis abhorrence of the assault on the Senator by Preston S. Brooks, he uttered in the Hall of Representatives that eloquent but scathing invective, which led to a challenge from Brooks. Mr. Burlingame expressed himself ready to meet any consequences which might follow. The result was that Brooks, the coward and bully he really was, backed down and out, he and his friends being apprehensive of the result of Burlingame's well-known skill as a rifle shot. President Lincoln appointed him minister to China, and it was in this capacity he won his greatest honors and fame. He secured the confidence of the Chinese authorities to an unusual extent, the outcome being that he was appointed ambassador to treat officially in the name of that government with all the civilized powers. Entrusted with this mission, he visited his own country, London, Paris, Berlin, and other European capitals, and lastly St. Petersburg, where our eminent Brother died after a brief illness, just as he had nearly completed his great diplomatic work. His sudden death cut short a career as brilliant as it was useful, and excited the regrets of a host of friends," not only in his native land, but among the various civilized nations of the world, where his work as a diplomat had been so successful. Amicable Lodge has had its share of honors, but we need to be often reminded that Masonry regards no man for his worldly wealth or position. It is not what we receive but what we are and do. "By their fruits ye shall know them." In preparing this inadequate story, my embarrassment has not been in lack of material, but in too much. But as you had your fiftieth historical address by Brother Lucius R. Paige, and your seventy-fifth by Brother J. Warren Cotton, I have endeavored to avoid too much repetition and detail, which are always a weariness to the flesh. I have purposely omitted to name the successive Masters and their work. Their names will be found on the program. Brethren, we have a hundred years of history lying back of us. It is a goodly heritage we possess. It has come through faithful service. The lights and shadows have fallen across the pathway the Lodge has come. The memory of the glory it has Won is the measure of the obligation that we transmit this inheritance unimpaired to those who shall follow us. And may we not hope and believe that the future shall be even more prosperous than the past or the present, and that it will be better further on? "Further on? But how much further? Count the milestones one by one? 'Twill be better further on." Agreeably to a custom established since the fiftieth anniversary of the date of precedence as granted to Amicable Lodge in its Charter from the Grand Lodge of the Most Ancient and Honorable Society of Free and Accepted Masons, on June 10th, A.D. 1805, at Cambridge, Mass., Amicable Lodge has celebrated each twenty-fifth milestone of its progress in life with appropriate ceremonies and a historical address. At the fiftieth Anniversary. A.D. 1855, Reverend Lucius R. Paige, D. D., Master of Amicable Lodge in 1846, 1847, and 1848, (and historian of Cambridge) gave the historical address, he began with the inception of the Lodge by Brothers Daniel Warren. Asa Ellis, Benjamin Bigelow, Charles Parks, Nathaniel Livermore, Isaac Barnard, Nathaniel K. Whitney. Jr.. Nathan Crane, Samuel Albree, John Wheeler, Andrew Adams, Luke Hemenway, Elijah Learned, Nathan Fisk, Salmon Morton, Ebenezer Watson, Daniel Smith, and William Warren, who formed the "Aurora Society" for Masonic instruction and met in southeast chamber of Mr. Hovey's Hotel on February 6th, 1805. On April 3rd they appointed a committee to procure a Charter, and elected officers for one year (if a Charter could be obtained). Andrew Adams was chosen Master, Nathan Crane Sen. Warden, Elijah Learned Jun. Warden, and a petition was presented to the Grand Lodge for a Charter under the name of Oriental Lodge. There being an Oriental Lodge already in the jurisdiction, the name of Amicable was substituted and Dr. Paige often remarked in the late years of his long life of 93 years "from personal observation I am confident there are few if any Lodges where more true amicable feeling exists than in this." It was the desire of the Brethren that the Lodge be consecrated and the officers installed on the first Wednesday in October, A.D. 1805, but the ceremonies were delayed until June 24, 1806. Dr. Paige reviewed the early struggles of the Lodge during the almost total prostration of business preceding the war of 1812. How what would seem now a trifling debt was then a burdensome obligation. How the Lodge by 1820 had established itself and had a charity fund of $1200.00. In 1826 an anti-Masonic tornado was started in New-York state which swept before it Masonry and Masonic institutions. Bigotry and fanaticism fostered by ignorance and hatred assailed not only Masonry but Christian Churches, and Masons were the objects of persecution and the subjects of physical dangers and social ostracism. On the 2nd day of July, 1838, when further resistance to the rising tide of unrighteousness seemed useless, Amicable voted to give up its Charter; and fearing even the dissolution of the Grand Lodge, voted that after its debts were paid all its assets be given to the town of Cambridge to be known as the Masonic Charity Fund." The Selectmen of Cambridge, evidently anti-Masonic, refused the offer, and thus through a succession of years have transmitted to us unimpaired the stone that the politicians refused, the money that now is the corner-stone of the Charity Fund of Amicable Lodge. On June 10, A. D. 1880, the Lodge observed its seventy-fifth anniversary. Brother J. Warren Cotton gave a very accurate and interesting historical address eulogizing the men who built and nurtured Amicable Lodge and his predecessor in historical matters; he further alludes to Amicable as the Mother Lodge of Cambridge. Let me quote him — "Amicable takes great pride in her children and one grandchild. The first and nearest Bunker Hill, and formed when the memories of the fathers were fresh in our hearts, bearing the patriotic name of one hundred years ago — Putnam. The next, that appealing to us from historical scenes since which the world has counted eighteen hundred years — Mt. Olivet. The third forming anew the covenant made nearly four thousand years ago between the Syrian Patriarch and his tricky son-in-law Mizpah. (And the grandchild) While in the West shines the bright star of Charity. Who can say but some speaker at the close of another period of years will state as a fact that 'the greatest of these is Charity.' " Brethren, the hour has arrived. Brother Cotton reviewed the period of the Civil War and the patriotism of the men of Amicable who were in the army of the North. Again I quote. "The Brotherly love and Charity of Masonry knew no such imaginary lines as were drawn by political or military authorities across our beloved country. Masons North and South were true to their obligations. The badge of a Mason, when properly worn was respected, and many a body of a Masonic Brother was honored by his temporary enemies. A rude board, roughly lettered 'Here lies a Master (or Royal Arch) Mason ' was sacred to opposing armies of both sides. And we of this day, reviewing our national solidarity, can truthfully say that Masonry during the dark days of civil strife fostered the spirit that has healed the wounds of 1861 and made us a nation of comrades and brothers in 1898 and in the World War. On June 8, A.D. 1905, Amicable Lodge celebrated its Centennial Anniversary. The exercises began with opening of the Lodge in the Masonic Apartments, 2070 Massachusetts Avenue, at 11 a.m. followed by the reception to the Master and members of the Lodge. Luncheon was served at 12 m. and at 1.15 p.m. the Lodge proceeded to the Porter Square Universalist Church, where an Organ recital introduced the program of the day. Prayer was offered by Rev. Bro. Charles Augustus Skinner, Chaplain. The Presiding Master, Charles Phillips Keith, made an address of welcome. Brother George W. Blish read the Charter of the Lodge, which was responded to by the Most Worshipful Grand Master of Masons in Massachusetts, Baalis Sanford. The Historical address by Rev. Bro. Charles Augustus Skinner, was followed by an oration by Rev. Bro. Edward A. Horton. The Harvard Quartette and orchestra gave musical selections. Benediction by Rev. Bro. Henry H. Saunderson, Associate Chaplain. At five o'clock the Lodge held a reception in its apartments to the Most Worshipful Grand Master followed by a dinner at which the following toasts were given: "The Grand Lodge of Massachusetts," response by the Grand Master, Most Worshipful Baalis Sanford. "The Masonic Brotherhood," response by Bro. Curtis Guild, Lieutenant-Governor of Massachusetts. "Amicable Lodge," response by Wor. James K. Odell, Past Master of Amicable. "The Second Masonic District," response by Rt. Wor. Henry A. Locke, D. D. G. M. for the Second District. Wor. Charles P. Keith, Master of Amicable, was Toastmaster. An Entertainment followed at 8 p.m., the closing feature of which was "Edison's Kinetograph." Dr. Charles A. Skinner, Chaplain of the Lodge and very much beloved by the Brethren and in the community, who was also Grand Chaplain of the Grand Lodge for fourteen years, gave a historical address in which he related much of the matter covered by his predecessors in Lodge history. Worthy of repetition is the fact that in 1808 and 1809 the chair was filled by Samuel P. P. Fay, Master, who became Grand Master of Masons in Massachusetts in 1820. The Senior Warden was Augustus Peabody, Esq., who afterwards became Grand Master, and the Junior Warden was Rev. John Bartlett, afterwards Deputy Grand Master. Thus Amicable began early in her career to train men worthy of high places. Henry Endicott was Grand Master in 1887, 1888, and 1881). He was also the first Master of Mizpah Lodge. His name adorns the hall in which we meet, and the minutes are recorded by the marble clock in the southwest corner which he presented. Lucius R. Paige, D. D., was Deputy Grand Master in 1852, 1853, and 1854. Rt. Wor. W. J. Whipple, Rt. Wor. E. W. Metcalf, Rt. Wor. W. Hillard, Rt. Wor. L. M. Hannum, Rt. Wor. Charles Harris, and Rt. Wor. Henry Locke, were District Deputy Grand Masters up to the year 1905. We should also recall today Brother An.son Burlingame, conspicuous as a member of Congress, friend and ally of Charles Sumner, Ambassador to China from U. S. A., and Ambassador from China to all the prominent nations, who passed away at St. Petersburg at the court of the Czar of all the Russias in 1879. There is a period not fully covered by my predecessors in historical matters which I may be pardoned for reviewing : that from 1871 to 1911 when the Lodge was in a transitory state. Her early homes, Hovey's southeast chamber, Boardman's Hall, Porter's Hall, Cutler's Hall, the School House on Franklin Street, Friendship Hall, were all destroyed by fire, tornado, or torn down or removed, ere she entered Odd Fellows Hall in North Cambridge, yet all these years she cherished the thought of a permanent home. On June 19, 1871, a preliminary meeting was held by chosen Directors to form an association. Amicable Lodge was represented by Bro. J. C. Wellington, Bro. George B. Eaton, and Bro. (afterward Wor.) William L. Lathrop. Mizpah Lodge by Wor. Bro. Henry Endicott, Past Master of Amicable, and Presiding Master of Mizpah, Bro. D. U. Chamberlain, Bro. George P. Carter, formerly of Amicable Lodge, Cambridge Royal Arch Chapter by Bro. Charles E. Bowers and Bro. H. L. Chase. Bro. J. C. Wellington, of Amicable Lodge, was chosen President, and William L. Lathrop, of Amicable Lodge, Secretary. William L. Lathrop, of Amicable Lodge, continued as Secretary until December 27, 1882, when he was succeeded by Brother J. Warren Cotton, of Amicable Lodge. (Lodge historian in 1880.) The Lodge then met in Union Hall. Wor. Bro. George P. Carter died in 1883. and Bro. J. Warren Cotton in 1884. They were succeeded by Wor. Charles Lyman Fuller, Master of Mt. Olivet, Secretary from 1883 to 1893, President in 1894, 1895, and 1896. and who died in 1896. In July, 1896, Bro. Charles C. Welch was elected temporary Chairman of the Masonic Hall Association. He was afterward President, which position he held until January 10, 1906, when he resigned and Bro. Walter C. Wardwell was elected. Brother R. Walter Hillard succeeded him, and was succeeded by Bro. Horace D. Litchfield, of Amicable Lodge. Wor. Bro. Clarence M. Howlett, of Amicable, appears as a Director, and Bro. Charles C. Welch becomes President again in June. 1910, which office he held during the laying of the corner-stone of the new Temple, and the Dedication of the Temple in October, 1911. Bro. Welch, while not a member of Amicable Lodge (he having been raised in Belmont Lodge, and later becoming a member of Putnam Lodge) deserves the undying gratitude of all Cambridge Masons. He was the prime mover in the building of the new, or present Temple, and one of its most active proponents in the preliminaries which led to its erection, and after its completion the advocate of every financial program to its benefit. Bro. Welch was also the most active in obtaining the Charter of Cambridge Commandery, K. T. He was its third Eminent Commander, and was beloved and respected by all Masonry. Wor. Charles H. Ackers and Bro. William B. McCoy, of Amicable Lodge, were also active in the building of the new Temple. On June 4, 1903, the Lodge voted that a committee of five be appointed to confer with the Masonic Hall Association on the advisability of building a new Temple. On January 7, 1904, Amicable Lodge held its last meeting in the old Temple, that is, the Masonic building which stood on the site now occupied by the Cambridgeport Savings Bank building. On February 3, 1904, Amicable Lodge held its first meeting in the Odd Fellows Hall, Massachusetts Avenue, and its regular meeting night was changed to the first Monday. December 30, 1904, a proposal was presented to the Masonic Association by the Cambridgeport Savings Bank to arrange suitable halls and rooms for the Fraternity in their building then being built. Many men have many minds, "the wisdom of future ages shall find out the right," but in contemporary history we write that the offer was respectfully declined. January 18, 1905, the Association voted "Be it resolved that the several Masonic Bodies should authorize the Directors of the Masonic Hall Association in conjunction with the presiding officers and Treasurer of each organization to take the necessary steps toward forming a corporation, for the purpose of obtaining a suitable lot of land and erecting a building thereon suitable for Masonic usages," and Bros. Frank W. Dallinger, of Amicable Lodge, Bro. George H. Howard of Cambridge Commandery, and Bro. Alfred B. Parker were appointed a committee to draft a code of bylaws for a corporation. A Committee of five, Wor. Bro. Charles H. Ackers, of Amicable Lodge, Bro. Harrie E. Mason, of Mizpah Lodge, Bro. John A. Hardy, of Mt. Olivet Lodge, Bro. Herbert A. Rhoades, Cambridge R. A. Chapter, and Bro. Charles O. Welch, Cambridge Commandery, K. T., were appointed to make a preliminary report on plane and finance. On May 5, 1908, it was voted "The Lodge approves the recommendation of the Masonic Hall Association to purchase the Woodbridge lot. situated on Massachusetts Avenue opposite Davenport Street, for a site for a Masonic Temple." At the same meeting the Lodge approved a loan to the Masonic Hall Association. In December, 1901, Amicable Lodge. Mizpah Lodge, Mt. Olivet Lodge, Cambridge Royal Arch Chapter, and Cambridge Commandery were members of the Masonic Hall Association. Preliminary plans had been adopted, and it is written, "Efforts should be made to bring Charity Lodge and Putnam Lodge into the Association for unity of action when the new Masonic Hall is built. The institution of a new Council of Royal and Select Masters in Cambridge seems very desirable if we consider the best interests of the Craft. This happy condition was soon consummated, and the new Council, and Charity and Putnam Lodges joined with all Cambridge Masonic bodies in the construction and maintenance of the present Temple. The corner-stone was laid June 30, 1910. The Grand Lodge of Massachusetts conducted the ceremonies under the direction of M. W. Dana Judson Flanders, Grand Master. The Harvard Quartette gave the musical program. An original hymn by Bro. Wm. K. Hyde preceded the request of President Charles O. Welch of the Cambridge Masonic Hall Association to proceed with the ceremonies. Response by Most Worshipful Dana Judson Flanders. Responsive Scripture reading by Rev. R. Perry Bush, D. D., Grand Chaplain, and the Brethren. Prayers by the Grand Chaplain. Reading a list of the contents of the box (laid with the corner-stone) by Rt. Wor. Charles H. Ramsav, Grand Treasurer. Application of jewels to the corner-stone. Libation of Corn, by the Deputy Grand Master, R.W. Rev. William H. Rider, D. D. Libation of Wine, by the Senior Grand Warden, R. W. Clarence A. Brodeur. Libation of Oil. by the Junior Grand Warden. R. W. Walter F. Medding. Invocation by the Grand Chaplain. Presentation of the working tools to the Architect, Brother F. B. Furbush. Proclamation by the Grand Marshal. Address by W. Rev. Frederick W. Hamilton, D. D. Benediction by the Grand Chaplain. Following the exercises a collation was served to a large gathering of Masons in the vestry of the Universalist Church next door by Brother Fred Lincoln Churchill. Brother Churchill was elected to membership in Amicable Lodge, June 6,1905, and served as Tyler of Amicable Lodge and other Cambridge bodies until his death on January 1, 1919. He was universally beloved for his unfailing courtesy and friendship among the Craft. His son, Fred Raymond Churchill, bears the unique distinction of being the first candidate to receive the Entered Apprentice degree in the new Temple. Rev. Dr. Charles A. Skinner, Historian of the 100th Anniversary, born April 19, 1824. Entered December 3, 1863, Passed February 4, 1864, Raised March 4, 1864. Honorary member February 6, 1905. Died April 22, 1906. Brother J. Warren Cotton, historian of the seventy-fifth Anniversary. Raised in 1865. Died 1884. Rt. Wor. Rev. Lucius R. Paige, D. D., first historian of Amicable, born in Hardwick, Mass., March 8, 1802. Raised April 9, 1824, in Little Falls, New York. Joined Mt. Zion Lodge in Hardwick June, 1824. Became its Master in September, 1826. Commander of Knights Templars, 1826. Joined Amicable Lodge in January, 1846. Master 1846. 1847, and 1848. Deputy Grand Master in 1851 and permanent member of the Grand Lodge. Honorary member of Amicable, March 6, 1873. Died in 1895. Early in the nineties our country began to acquire a world consciousness. And Masonry is a very good barometer or reflector of national morals and true patriotism. The increase in membership waxes great when national ideals are threatened or war is in the offing. Masonry has always assumed that we are "our brother's keeper." Suffering Cuba reflected the violation of all the high ideals for which Masonry stands; and Amicable's membership increased more rapidly in 1898 and 1899 than in any previous period since 1861 and 1865. The Lodge has many valuable pieces of furniture used in the old Lodge-rooms, together with historic pictures in the lower hall of this building, and the interesting pictures and relics of the past that adorn the wall in these upper halls. April 2. 1903. Brother James M. Learned, of Indianapolis, presented the Lodge with an apron worn by his uncle. Oliver Fuller, when he was Senior Warden of Amicable Lodge in 1805 and 1806. He requested it be hung with a notice of Brother Fuller's of a meeting held in Brother Hovey's northeast Chamber, which notice he had previously given the Lodge. In 1903 and 1904 we find the record of the James A. Woolson Fund, a bequest which was held by the Lodge as a separate fund for a few years and afterward added to the Belief Fund. No Master of Amicable Lodge will ever lack the working tools with which "to rule and govern his Lodge." We have gavels, common and uncommon. June 8, 1905, Mrs. Phoebe C. Goodwin presented, by the hand of Rev. Bro. Charles A. Skinner, a gavel the wood of which was taken from the "Peace Tavern" where General Washington was entertained in Sherman, New Hampshire; the handle end is from the old Hancock House, the residence of our first Governor of the dear old Commonwealth of .Massachusetts. "With the best wishes for a Masonic Body so dear to the heart of a Mason's daughter, and a sister of four Mason brothers, and a Mason's widow." At the meeting June 4, 1907, Bro. John H. Googins presented a gavel made from the wood of the frigate Constitution. In 1924 Bro. Ralph W. Robart. then candidate for Mayor of Cambridge and member of the City Council (well known veteran of the World War), presented to Amicable Lodge a gavel made from the wood of the Washington Elm, with an appropriate speech in honor of George Washington. On Wednesday. October 18, 1911, the present Masonic Temple in Cambridge was dedicated. This ceremony was participated in by all the Lodges of Cambridge, but Amicable Lodge was the "Mother Lodge" and host. Amicable Lodge was opened to receive the Most Worshipful Grand Master of Masons in Massachusetts, M. W. Dana J. Flanders, and the members of the Grand Lodge. At six o'clock dinner was served and at eight o'clock the following program was presented. Reception of the Grand Master and his suite. Selection by the Harvard Quartette, who gave the musical program throughout the evening. Prayer by the Grand Chaplain, Rev. R. Perry Bush, D. D. Surrender of the Working Tools by the Architect, Bro. Fred D. Furbush. Address to the Grand Master, Wor. Samuel D. Elmore, Master of Amicable Lodge. Reply by the Grand Master. Examination of the building by the Grand Officers. Ceremonial Dedication to Freemasonry. Ceremonial Dedication to Virtue. Ceremonial Dedication to Universal Benevolence. Invocation by the Grand Chaplain. Proclamation by the Grand Marshal. Wor. Harry P. Ballard. Anthem "To Thee all praise be given." Address by the Grand Master. Dedication Hymn "Hail Sacred Fane." On December 4, 1913, a delegation of Brothers who were members of the Lodge and Veterans of the Civil War were received, and Wor. Bro. James K. Odell in behalf of the Brethren of Amicable Lodge presented a standard of National Colors to the Lodge. Wor. John Hamilton, Master, responded and accepted the colors. On March 4, 1915, Wor. Bro. William H. Walker presented to Wor. Bro. William L. Lathrop a loving cup in commemoration of the fiftieth anniversary of his membership in the Lodge. Wor. Bro. Lathrop was spared to be with us for a long life. His last years were blessed by the utmost affectionate regard of all the Brethren. If Masonry canonized its saints the name of William Locke Lathrop would be found among the foremost. He personified the true spirit of Amicable Lodge, and when he spoke in Cambridge Royal Arch Chapter as Past High Priest, or in the Lodge as Chaplain, his voice had the fire and consecration of youth and that sympathy that comes from "the happy reflections of a well spent life." He was an inspiration to "all from the youngest entered apprentice in the North East corner to the Worshipful Master in the East." March 13, 1928, he enrolled with the Celestial Lodge above. The historian in 1880 wrote that "one fifth of the members of Amicable Lodge volunteered in the Civil War." That record is amply perpetuated by the Honor Roll of the World War which follows. (The roll is here omitted, but will be found in the volume published by the Lodge.) Masons are men of peace, but from time immemorial Masons have been taught that they owed a duty to God and their country. This Honor Roll will never be complete, the modest reticence of World War combatants may prevent well deserved names from appearing here, but it will never minimize our esteem and veneration for those who fought to save civilization. Alfred Martin. Jr. Born February 21, 1898. Passed February 21, 1918. Killed in Action in France, July 19, 1918. Kenneth Dixon McKenzie, Born September 21, 1891. Raised July 20, 1918. Died September 29, 1918. Up to date 105 names are recorded on this roll; and this "one-fifth" of the membership in 1919, is a magnificent upholding of the records of the fathers. When the Masonic Home at Charlton, Massachusetts, was opened Amicable Lodge participated. The Lodge has always paid its full quota per member for the support of this Masonic charity, besides having a vital interest in its welfare. Amicable Lodge furnished a room at the Home and has established the custom of making an annual pilgrimage to the Home. The Lodge has a like interest in Juniper Hall, the Masonic Hospital in Shrewsbury, Mass. While this Masonic charity is still young and our membership not fully canvassed, yet the fact that Amicable Lodge has accepted its full share of responsibility is a guarantee of the complete success of the program. Amicable Lodge officers have always been efficient in the duties assigned them by the Grand Master and Grand Lodge; and have participated as instructors in the Lodges of Instruction, and in every worthy program advanced by the Grand Lodge for the welfare of the Craft. The George Washington Memorial Fund, our national tribute to a great exponent of American Masonry, has received the full quota of support from Amicable Lodge, and will continue to receive it until the last cap stone is seated. Mt. Carmel Lodge, of Lynn, was instituted on the same day as Amicable Lodge, and through all these one hundred and twenty-five years they have enjoyed a happy companionship and styled themselves sister Lodges, or twins. Twelve years ago, during the term of Wor. Bro. Charles L. Hille as Master, the Lodges began a custom which has ever since obtained, that of an annual visitation of Amicable to Mt. Carmel and Mt. Carmel to Amicable. The very happy visitation of Amicable to Mt. Carmel in the current year when we worked the third degree there, is only symbolic of the fraternal ties that have grown stronger as the years go by, and of a true spirit of the universality of Freemasonry. in 1855, at the Fiftieth Anniversary, the Lodge had 62 members, in 1880, at the Seventy-fifth Anniversary, there were 206 members, in the Centennial year 1905, there were 316 members; today we number about 725 members. Most careful in her selection of Masonic material, Amicable has ever esteemed quality above quantity ; and she rests securely in Hie fact that the character and reputation of her members in the community is a safeguard and security of her future prosperity. On June 24th, 1928, St. John's Day, members of Amicable Lodge paid a fraternal visit to Golden Rule Lodge No. 5 at Stanstead, Quebec. Golden Rule Lodge meets once a year (on St. John's Day) on the top of Owl's Head Mountain, 2350 feet high, in a natural Lodge-room overlooking Lake Memphremagog, in Stanstead, after the manner of our ancient Brethren who usually assembled on high hills or in deep vales. No cowans or eavesdroppers were observed, but the present Master, brought away some interesting motion pictures revealing the prowess of Amicable Lodge men as mountain climbers; and as reminders of a very happy occasion with our Canadian Brethren. As the historic foundation of Masonry in Cambridge, Amicable Lodge has welcomed the additions to our local Lodges. Richard C. Maclaurin Lodge was instituted in 1920, The Harvard Lodge in 1922, Boston University Lodge in 1925. To each of these Lodges Amicable Lodge has presented at their institution the Three Great Lights of Masonry, as symbolic of our fraternal interest in their welfare, and our cordial regard for their fellowship. United Lodge, instituted in 192. "), being already supplied with the Great Lights, Amicable Lodge presented an appropriate gift. During the past twenty-five years the Grand Lodge has honored us with the following appointments. Rt. Wor. Edward F. Wallis, District Deputy Grand Master for the Cambridge District in 1926 and District Deputy Grand Master for the Cambridge 2nd Masonic District in 1927. Wor. Lyman Sawin Hapgood, Junior Grand Steward in 1924. We rejoice in having with us today so many living Past Masters, the dean of whom. Wor. Bro. Frank W. Dallinger, was Master in 1884 and 1885. He frequently presides at our annual elections, and has lost none of his keen perception, sense of humor, nor the high esteem and affection of the Brethren. Wor. Bro. Elbridge G. Stevens, Master in 1888 and 1889. and Secretary since 1899 — 31 years of service in that most important office which he has filled with unrelenting zeal for the welfare of Amicable and during which he has faithfully supported the program of every Master, and endeared himself to the Brethren. Wor. Bro. Stevens and his wife were tendered a reception by the Lodge on the occasion of their fiftieth wedding anniversary. Wor. Bro. Charles H. Ackers, Master in 1902 and 1903. Wor. Bro. LaForest D. Howe, Master in 1908 and 1909, Wor. Bro. Samuel D. Elmore, Master in 1910 and 1911. Wor. Bro. Charles A. Stover, Master in 1912. Wor. Bro. John Hamilton, Master in 1913 and 1914. Wor. Bro. William H. Walker, Master in 1915 and 1916. Wor. Bro. Albert W. Pratt, Master in 1917. Wor. Charles L. Hille, Master in 1918 and 1919. Wor. Bro. Lyman S. Hapgood, Master in 1920 and 1921. Rt. Wor. Edward F. Wallis, Master in 1922 and 1923. Wor. Bro. Francis L. Bain, Master in 1926 and 1927. Wor. Bro. Arthur W. Weysse, Master in 1928, dimitted in 1930. And the present presiding Master, technically a Past Master although his term has only begun, Wor. Bro. Eugene Barry Wyman, Master in 1930. And in this connection it is not improper to mention our esteemed Treasurer. Bro. Joseph Henry Webber, who has served with the highest fidelity and genial fellowship for 21 years. His records stand approved. And now, in memoriam, of one who has so recently left us that one cannot realize his passing, and we must class him living in spirit. Wor. Bro. Walter Herbert Nay, Master in 1924, 192;"), and 1929, Secretary of this Anniversary Committee. Most zealous and energetic in behalf of Masonry and whose presence and counsel we increasingly miss. Admitted to the Celestial Lodge above March 15, 1930. Amicable Lodge has ever been insistent that each candidate should have thorough instruction in Masonry and learn every lecture. During the active work of Wor. Bro. James K. Odell, Master in 1882 and 1883, all candidates were required to give the lectures on the floor of the open Lodge, and Wor. Bro. Odell served as Chairman of the Instruction Committee until the administration of Wor. LaForest D. Howe in January, 1908, when Brother Everett W. Doe became Chairman of the Instruction Committee, which position he still fills (22 years) much to the satisfaction of the Lodge, and the gratification of the candidates searching for Masonic Light. During all these years every candidate has been examined in the open Lodge in every degree, with the exception of emergencies due to war activities or special Dispensations granted by the Grand Master. One candidate, immediately on reaching his graduation, became an instructor, and served most acceptably. Amicable has ever taken the admonition that to relieve the distressed is a duty incumbent on Masons seriously. The most excellent gift of Charity is not a lost art in Amicable. No worthy member of the Lodge has ever been forgotten. Tn this work we have had services of Rt. Wor. Edward P. Wallis, Bro. Leonard H. Hicks, Bro. George E. Preble, and Wor. Lyman S. Hapgood who have given a great deal of time and effort to this vital department of Masonry. Bro. Charles T. Choate of the present Board of Trustees of the relief fund, and Bro. John T. Webster, associate member, are also conscientious workers. And we read in our early history that members of Amicable in the Grand Lodge, were insistent in the establishment of relief funds. I wish to express my appreciation of the assistance afforded me by the Wor. Master Eugene Barry Wyman, by Rt. Wor. Bro. Edward F. Wallis, Wor. Bro. Lyman S. Hapgood, and Wor. Bro. Elbridge G. Stevens, in obtaining material, also to Wor. Bro. Irving C. Langley, of Putnam Lodge, for many recent years Secretary of the Masonic Hall Association, for his aid in my research. And now Brethren, we learn from Masonic tradition that our Craft was originally a pure democracy, in which the humblest entered apprentice and the most exalted Master met on the same level. We also learn that it is not in the power of any man or body of men to make changes in Masonry. Lest the modern desire for super-organization should wipe out the ancient landmarks of our forefathers, who served without salaries and with true charity at heart, let us build, not towers of Babel, but new Temples to the Ever Living God, in whose jurisdiction there is neither variableness nor shadow of turning. By Right Worshipful Arnold F. Thomas. On February 6, 1805, eighteen Masonic Brothers met at Hovey's Tavern in Cambridge, Massachusetts, to consider the formation of a new Masonic Lodge. On April 3, a committee was formed to procure a charter, and officers were elected for one year, provided a charter could be obtained from the Grand Lodge. Andrew Adams was chosen Master, Nathan Crane, Senior Warden and Elijah Learned, Junior Warden. It was proposed to call the new Lodge Oriental, but there being an Oriental Lodge already in Massachusetts, the name Amicable was substituted; a happy and fortuitous choice. The actual consecration and installation of officers took place on June 24, 1806, a year after the charter was received on June 10, 1805. On the fiftieth anniversary, in June, 1855, appropriate ceremonies and an address by Rev. http://masonicgenealogy.com/MediaWiki/index.php?title=MAGLLPaige Lucius R. Paige] commemorated the first half century of Masonic activity. On June 10, 1880, at the seventy-fifth milestone, there was an historical address by Brother J. Warren Cotton, who called Amicable the Mother Lodge of Cambridge, and rightly so, because from its members had already originated Putnam, Mount Olivet, http://masonicgenealogy.com/MediaWiki/index.php?title=Mizpah Mizpah] and Charity Lodges, all of which exist today and meet in this same temple. On June 6, 1905, Amicable Lodge celebrated its centennial anniversary. The historical address was given by Rev. Charles Augustus Skinner, and the evening was high-lighted by a showing of a new invention called Edison's Kinetograph, or what we now know as Moving Pictures. On June 10 and 11, 1930, occurred the one hundred and twenty-fifth celebration. It is worthy of note that Worshipful Eugene Barry Wyman, who was Master on that occasion, is still very active in the work of the Lodge, and its members owe him a great debt for his unflagging interest and participation in the degree work. From 1930 to 1955, Amicable Lodge has proceeded serenely on its way, making Masons and men and adding to its lustre. It survived the depression of the 1930's, although it lost a great proportion of its members through inability to pay their dues. This circumstance is not without its compensations. To quote the old saying "once a Mason, always a Mason," is to state a simple truth. Although these men are not affiliated with a particular Lodge, their absorption of Masonic truths and precepts cannot fail to influence their lives and contacts, and make them better men, more tolerant and understanding of their fellow creatures. In World War II, many members of Amicable Lodge wore the uniform of the Armed Services of their country, as they did in the War of 1812, the Mexican War, the Civil War, the Spanish American War and World War I. In the drive for funds for the Masonic Service Association of the United States and Canada, Amicable Lodge well exceeded its quota. I know, for I was Master at that time. Its members also turned out in good quantity for the Boston Parade on a cold and rainy day to mark the 200th anniversary of George Washington's becoming a Mason. Amicable Officers, and through them, Amicable Lodge, have been honored many times by appointment to Grand Lodge positions by various Most Worshipful Grand Masters. It has been one hundred and fifty years of Masonic activity, sometimes placid, but mostly of unbelievable busyness. We are tremendously proud of our glorious past, and look forward with the keenest of interest and a renewed zest to the next century and a half. Surely an organization that has persisted solely on merit for so long is entitled to view with satisfaction and delight its glorious past, and to look to the future with supreme confidence. R. W. Thomas L. Parker, Master. W. Luther Gay, S. W.
W. John Tarbel, J. W.
E. W. Metcalf, S. D.
Bro. Eliab W. Metcalf, S. W.
Bro. William Hillard, J. W.
Bro. William J. Whipple, Sec. Bro. Marshall Livermore, S. D.
Bro. Charles Willard, J. D.
Bro. G. Merritt, S. S.
Bro. Billings Smith, J. S.
Bro. T. F. Norris, Chaplain. Trustees of Charity Fund: Nathaniel Livermore, Isaiah Bangs, William J. Whipple. The officers of Amicable Lodge, Cambridgeport, were installed by the Grand Lodge of this State, on Tuesday evening, March 17th. A large number of Brethren were present, and the prospects of the Lodge are encouraging. Among the members present were two of the original petitioners of the Charter, which was granted in 1805. We regret to learn that the Hall occupied by Amicable Lodge, at Cambridgeport, was destroyed by the recent extensive fire in that city. We understand, however, that the regalia and many of the fixtures were saved, and that the loss is covered by insurance. We also learn that a new and more convenient hall will be soon fitted up for the accommodation of the Lodge. Wm F. Knowles, J. W.
L. R. Paige and B. F. Nourse, Trustees of the Charity Fund. F. W. Gregory, J. Warden. F. W. Gregory, J. W.
S. P. Adams, J. D.
Br. Fiske was installed as Treasurer for the twenty-first time, and Br. Tufts was installed Secretary for the thirty-first time. At the conclusion of the installation services, a banquet was provided for three hundred persons, and the occasion was made one of much social enjoyment. Speeches were made by Brothers Charles C. Dame, Wyzeman Marshall, William Parkman, and others. The entertainment concluded with a song from Br. C. G. Jackman, of this city. The new Lodge-room is a very fine and spacious apartment, appropriately chaste in its finish and furnishings. It is not probably excelled in these respects by any similar room in the State. The ante-rooms are equally elegant, and are most admirably adapted and fitted up for the purposes for which they are designed. The Regular Communication of Amicable Lodge, on May 1st, was vested with more than ordinary interest, by reason of the notice that the M. W. Grand Master was to be present, and, as is usual just now, it was expected that he would address the brethren on the affairs of Grand Lodge, but especially in regard to its finances. Nearly 200 brethren were present, who witnessed the work on the Third degree, rendered in a creditable manner by W. M. W. L. Lathrop, and his associates in office. Amicable Lodge enjoys the distinction of having Bro. Charles Tufts, now in his seventy-fifth year, who was made a Mason in 1828, and is now serving his forty-ninth year as Secretary. The Lodge has precedence from June 10th, 1805, and its charter bears the signature of Isaiah Thomas, G. M., Simon Eliot, D. G. M., Joseph Laughton, S. G. W., John Soley, J. G. W. and John Proctor, G. S. It suspended work during the antimasonic times, but resumed by authority of Grand Lodge, Dec. 27th, 1845 and is among the most prosperous. At the close of the work, the Grand Master, as was expected, addressed the brethren, and explained to them fully the exact condition of Grand Lodge affairs ; the general opinion seemed to be, that, no matter whether it was wise or unwise to have built the Temple at the time it was erected, the only thing to do now, is to pay the debt. It seems quite evident that the brethren of Amicable Lodge are desirous of knowing all that is proper, and that they mean to sustain their good reputation, and that of the Grand Lodge. The officers of Amicable Lodge were installed the evening of January 5th, by Past Grand Master William Parkman, at the special request of W. M. James K. Odell, who on this occasion advanced from the Senior Warden's chair, to that of the Worshipful Master's of one of the oldest and best known Lodges in the jurisdiction. After the installation the new officers worked the Third Degree in a very handsome manner. The veteran Secretary, Bro. Charles Tufts, was again installed into the office which he has so well filled for more than fifty years. We accepted the imitation from W. Bro. James K. Odell, Master of Amicable Lodge, to visit that Lodge on Thursday Evening, October 5th, it being the occasion of official visitation by the District Deputy Grand Master. The hall was full to overflowing with brethren, members and visitors, who were pleased to witness the skill of Master and Officers in the work of Masonry. An attempt to count the jewels worn by Past Masters failed, but there were two dozen or even more of such present. An examination of the visitor's Register, showed that forty-three different Lodges were represented, and we should put the entire number of I brethren present at something over three hundred. The occasion seemed like an ovation and must have been peculiarly gratifying to taster and members. A Collation was served at the close. A public installation of the officers of Amicable Lodge, F. and A. M., of Cambridgeport, was held on the evening of January 4th, at the Masonic apartments on Main Street. A large company was in attendance. The installing officer was Most Worshipful Brother Henry Endicott, Grand Master of Massachusetts, assisted by Brother C. L. Russell, who acted as Marshal. The installation exercises were interspersed with solos by Miss May Gooch and selections by the Mendelssohn Quartette and Allston Orchestra. The festivities were concluded in Temple Hall. 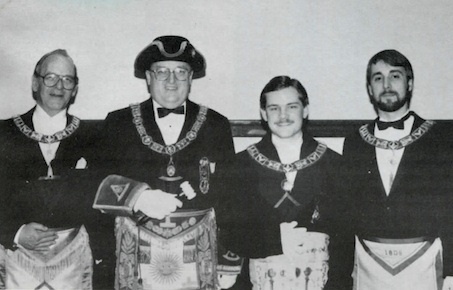 R. W. William Paterson, TROWEL rep. of Amicable Lodge, in the Cambridge 2nd District, relates that the Lodge celebrated its 2,000th Regular Communication on April 7, 1988, with a fine program and anniversary dinner served by members of Boston Chapter, Order of DeMolay. A special ceremony honoring the occasion was presented in a theatrical mode by the Master and Wardens in displaying and speaking of the various eras in the history of the Lodge. Wor. Charles E. Lewis, presiding Master, represented Wor. Andrew Adams, first Lodge Master. He was attired in the dress of 1803 and reviewed the first century of the Lodge's history. Bro. Robert C. Quinton, Senior Warden, represented Wor. Charles P. Keith, the 49th Master. Attired in the dress of 1905, he recounted the Lodge's history in its second century. Bro. Keith C. MacKinnon, Junior Warden, represented himself as Master in 1990, looking forward to the 200th Anniversary of the Lodge in 2005 and beyond into the 21st century. During the presentations by the Master and Wardens, various Lodge artifacts such as the charter granted by M.W. Isaiah Thomas, a patriot of the Revolutionary War in 1805, pictures, and Lodge items were displayed for viewing. Participating in the ceremonies were: M. W. Albert T. Ames, Grand Master; R. W. Roland K. Woodberry, S. G. W.; R. W. Al Rose, J. G. W.; R. W. Merrill B. Hall, D. D. G. M., Cambridge 2nd District; R. W. Ernest A. Pearlstein, D. D. G. M., Boston 2nd District; R. W. Lowell U. Hammett, Grand Marshal; R. W. Fred A. Dobson, Gr. Std. Bearer; R. W. Richard E. Johnson, Grand Pursuivant; Wor. Russell S. Finbow, Grand Pursuivant; and Wor. Marvin L. Eatough, Grand Organist. Also participating were: Wor. Benjamin T. Wright, Esq., Past Master of the Lodge and great grandson of M. W. Samuel P. P. Fay, Lodge Master in 1808-09 and Grand Master in 1820; also Wor. John Endicott Hutchins, Past Master of Blue Hill Lodge and great grandson of M. W. Henry Endicott, Master of the Lodge in 1864-66 and Grand Master 100 years ago in 1887-89. Wor. Frank M. Lewis, on behalf of the Lodge, presented the Grand Master various books of the Lodge's history and, in honor of the occasion, presented him a check for $2,000.00 to be used for renovations at Masonic Home. The check was given in memory of the late Wor. David S. Crilly, Past Master of the Lodge, who had been a resident guest at the Home. The festivities were closed by the Grand Master who observed that "This program by Amicable Lodge was a neat, unique, and outstanding presentation that made a most worthwhile Masonic evening!" Bro. Robert C. Quinton, Senior Warden; the Grand Master; Wor. Charles E. Lewis, Lodge Master; and Bro. Keith C. MacKinnon, Junior Warden. This page was last modified on 16 September 2017, at 19:58.